Intensity of flavors and exactitude of sourcing are top priorities at Chester Gerl's new Mexican spot. Well, those and tequila. 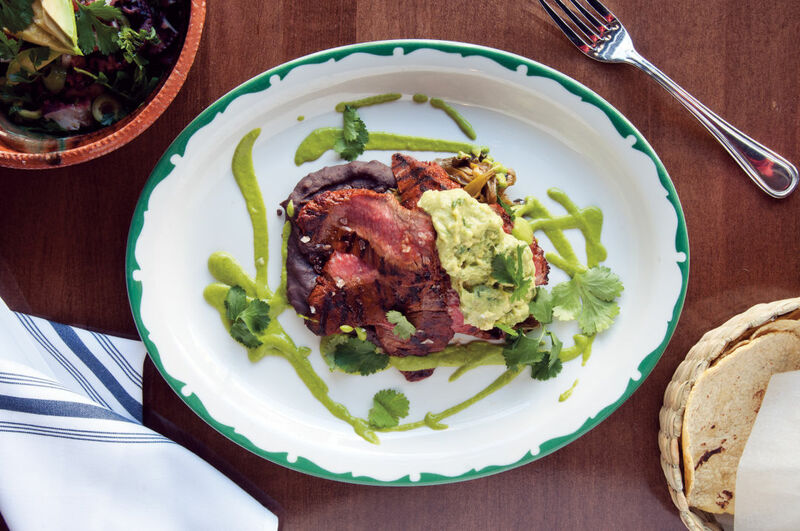 Carne asada chili-rubbed skirt steak served with black beans, charred vegetables, guacamole. A gordita, for those familiar only from Taco Bell’s ad agency, is one of Mexico’s great street pleasures: a fried pocket of the ground corn called masa, stuffed with carnitas, beans, cheese, crema, and pico de gallo. That’s the version described on the menu at Gracia, anyway, the new pan-Mexican restaurant on Ballard Ave where I was swiping bites off my daughter’s plate. Mostly of masa. Because if you take the most flavorful corn you’ve ever tasted, then explode that by some exponential factor—then triple that—you’re almost at the sweet-savory intensity of this corncake. It’s there in the tortillas too, which from your table you can see a chef pressing in Gracia’s open kitchen. They arrive in a basket, pliant and chewy and sketched with char, which lends smoky depth. They are the single most glorious thing about Gracia. Chester Gerl, Gracia’s owner, all but designed the restaurant around them. 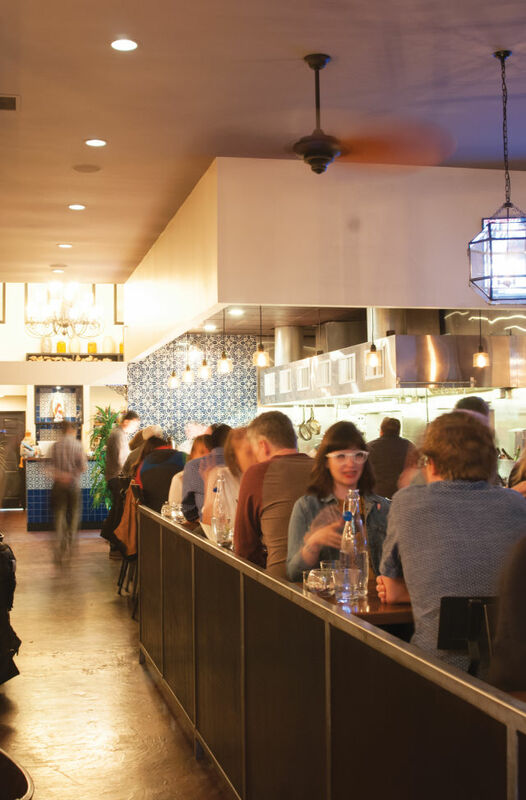 Gerl’s is a name you might remember from his years at Matt’s in the Market, which he led through its transition from closetlike cult classic to essential anchor of Pike Place Market. Three years ago Gerl decamped for New York, where he cooked in a few of the Marc Meyer/Vicki Freeman restaurants. One, Rosie’s, reacquainted Gerl with the Mexican food he grew up loving in Southern California. He told his mother, Grace: Find me a space in Seattle and I’ll come back. She did. So he did. And Gracia—Spanish for “grace”—opened in February. And though there is something formulaic about any space opening on Ballard Avenue—yup, seen this lively bar before, this skinny room, these brick walls—there is an undeniable south-of-the-border loveliness to this one, from the leche-toned walls to the acreage of Mexican tile. The Blessed Virgin’s even in the house—in back, where she doesn’t have to trouble herself with the tequila or the mescal, or the barflies actively worshipping all 75-plus varieties. But make no mistake. By far the most Mexican thing on these premises is that masa. Gerl sources various heirloom strains of corn—the really flavorful ancient variants: currently two yellows, two blues, and a white—from small Mexican farmers who’d otherwise be feeding it to their livestock. Gerl grinds the dried kernels in a molino, then makes the masa into the tortillas that form the foundation of the tacos and antojitos, or “little cravings,” portions of the menu. Which is where you’ll find huarachitos, coaster-size blue corn tortillas heaped with powerful duck confit (not often seen in Mexican joints, but sometimes seen in Mexico), smoky salsa roja, lettuce, and drizzles of crema. Gerl prefers the blue corn for these as its thicker texture holds up best to his pork lard. Tacos, for which Gerl uses the lighter corns, are solid and potent: among them barbacoa with vivid and almost gamey shreds of lamb and the deeply smoky dried chili pasilla de Oaxaca, unctuous carnitas breathing notes of cinnamon and orange and dappled with nickels of pastel watermelon radish, halibut wicked crunchy with beer batter and nestled into its tortilla with lime-drenched cabbage and rings of jalapeño. The chilies and vegetables contribute, of course, but what gives these little assemblages their power is the hit-you-over-the-head potency of the meat. If Gerl is a fool for corn from far away, he’s all about meat from close to home—sourced for flavor, from Carleton Farms pork to Grimaud Farms duck. A carne asada plate, one of four or five entrees nightly, features tender slices of the blushing skirt steak fanned across black beans and charred onions and chilies, the latter of which trail their elegantly bitter counterpoint across everything they touch. Flavor roars out of the adobo-rubbed meat, the mesquite-and-apple-wood open-flame grilling, and the sheer purity of the beef. Between the corn and that meat, flavor trumps everything at Gracia. 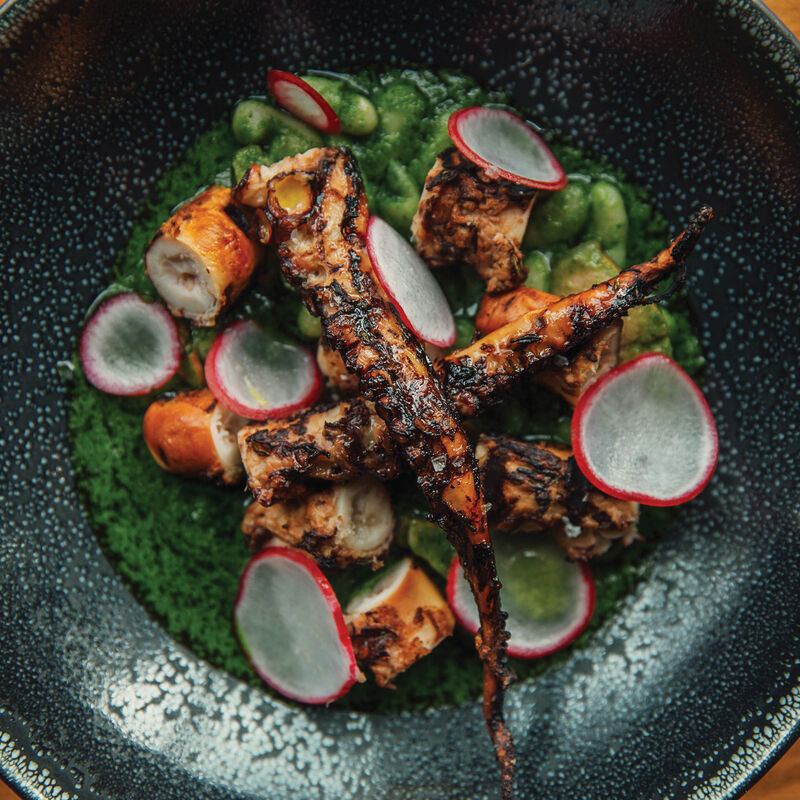 (The Veracruz-style octopus salad—full of the high tang of capers and olives and tomato and the brine of uncommonly tender octopus—eats like swimming in the ocean with your mouth open.) Flavor even trumps invention—itself a novelty in these novelty-worshipping times. Oh, Gerl will occasionally off-road a little, make ice cream out of mole or some such, but generally he maintains geeky fidelity to traditional treatments of traditional dishes. Posole is standard and stolid. Huevos divorciados—a brunch staple featuring drippy eggs over salsa roja, salsa verde, and black beans—is classic and unsurprising. 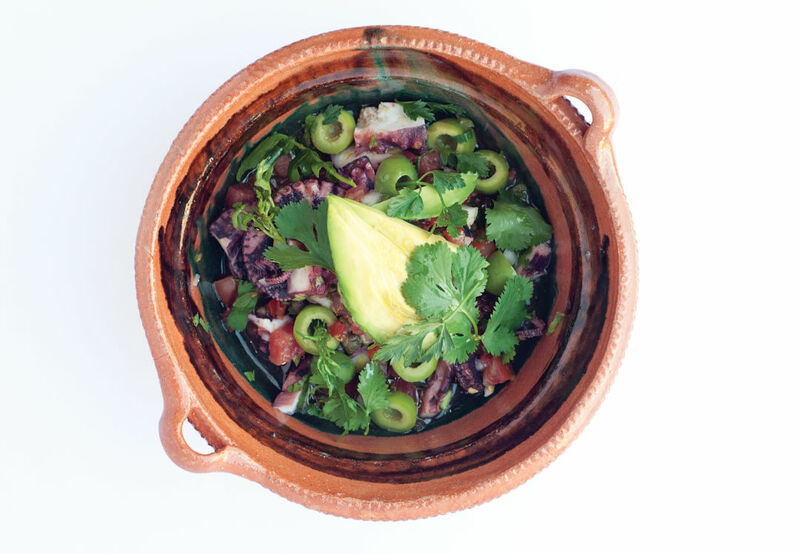 Veracruz-style octopus salad with olives, capers, tomato, and avocado. Okay, so they left the billed beans out of the gordita. Big deal…they certainly aren’t a traditional necessity, and it’s not like the thing wasn’t already gorda enough. But putting something on the menu that isn’t delivered is a default, never mind how trivial, on a kitchen’s contract with the diner. So when I came for brunch and ordered chilaquiles, and what arrived was a bowl of (dry, one-note) chili-sauce-coated tortilla chips topped with (fresh and lushly scrambled) eggs, I consulted the menu. Yep, crema. Where was the crema? Gracia is guided by a craftsman devoted to his vision for the food—an almost wonderful quality in a restaurateur. To earn the wonderful, a restaurateur has to be just as devoted to his diners. That’s where Gerl could improve. Tables are too small for the multiple plates of antojitos one will almost certainly amass here. Though servers are cordial and informed, meals take too long arriving. I’ll even put our dessert of roasted plaintains with crema and cotija cheese into this category: a nearly inedible severity of bland starchiness that needed more toppings for relief, or at least some caramelized sugars. Yes, people roast plantains in Mexico. But they also fry them—and that makes for a tastier dessert. And that should count for something.